I am indebted to the current Milton Keynes Quaker Centre for their permission to reproduce this research here. The photos here were all taken in 2006. This history originally appeared in the “Leighton Buzzard Observer”, in a series of articles from November 1938 to January 1939. Later that year, 31 copies were printed by H. Jackson & Co., Leighton Buzzard. 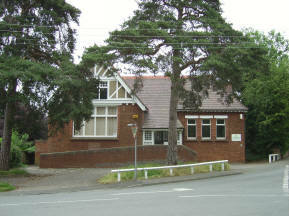 The Woburn Sands Library occupied the later Friends Meeting House in Woburn Sands for many years before it became a nursery. Hogstye End, now known as Woburn Sands, was at that early date but a very small hamlet at the southern end of the parish of Wavendon, originally called “Wandon” and “Wavendene.” It consisted of a small Manor which included Abbots Wood and the Fuller’s Earth Pits, a few labourers cottages, the residences of several yeoman farmers, and the essential mechanics and shopkeepers. It lies about six miles south of Newport Pagnell, and two miles north of Woburn on the main road from London to Northampton. Its quaint and bewitching name baffled the learned scholar, Dr. J. D. Barry, MA., evidencing his non-acquaintance with the area. Just as London has its gates, lanes and crosses, so has this area its “ends,” for within a few miles there are over twenty of them, in this parish there being five – Lower End, Duck End, Church End, Water End and Cross End, without counting our own Hogstye End. In the days when our “ships are British Oak,” forests of oak were very dense in this country, and served not only the Navy, but contributed food in the form of acorns for large herds of swine, and hereby in their turn the poor peasantry were provided with their Sabbath luxury. In Doomsday Book we read Luton was assessed for 1000 hogs, Ridgmont 300, Leighton 100, Aspley Gowis 50. It is recorded that Catharine of Aragon, when residing at Ampthill, taught the art of lacemaking. The women of Hogstye End very soon became efficient in the art which spread throughout the whole of Buckinghamshire. Later straw plaiting and hat and bonnet making were introduced. The fuller’s earth pits employed some men. There were two pits, one each side of the main highway, and the fuller’s earth produced was of unsurpassed quality, being sold at ten shillings per ton. The two pits lay on the opposite sides of the hamlet, one on the Heath Road and the other on the Aspley Hill; in 1539 a patent was granted to the landowner named John Shephard. Handmade lathes was another industry of local importance to the men. Victor Hugo in his “Laughing Man,” Book IV, refers to it, and the specimen is a ladder which was deposited at the Abbey for some time, but finally found its way to Southwark gaol. Another interesting specimen dug up by one of our own members, Richard How, of Husborne Crawley, was a tree 10 feet long and 10 inches in diameter, having several branches. The present writer has several specimens which vary in colour according to the sand deposit from which they have been excavated. Woburn Sands, as the village is now called, is a delightful inland health resort charmingly situated amongst glorious woods of Fir, Pine, Larch, Elm, Beech and the stately Oak, while the “Queen of the Forest,” the graceful Silver Birch, adds its own peculiar charm to many a sylvan glade. It may be of interest to learn how the name Hogstye End became changed to that it now bears. Evolution means development and about the year 1800 the inhabitants developed a dislike to the early name and contracted it into Hogsteen. The sand of the soil being very conspicuous, others addressed their letters “The Sands, Woburn,” which passed for a short period until under the encouragement of a landed proprietor, Mr. Dennison, Woburn Sands was accepted. Bryant’s map of Bedfordshire, 1825, has both Hogstye End and Woburn Sands, but in 1846 the railway opened up and accepted the new name. Even then Kelly’s Directory, 1847, puts Hogstye End or Woburn Sands, and so Hogstye End vanished from the world. In 1644 when only nineteen years of age, George Fox made a prolonged stay at Newport Pagnell. Little or nothing is recorded of those months, but events later evidenced that something had been accomplished, for the following year, 1645, we have the names of Richard and Sarah Marks as Quakers at North Crawley. In 1648, “Francis sonne of Robert and Susan Newman borne.”, “Jonathon sonne of Mary Brierly borne.”, “Robert and Ann Glidwell”. In 1649, “Mary daughter of Henry and Hannah Glidwell borne.” The Glidwell family is still strong in North Crawley. Our present moral outlook finds it difficult to credit the story in a so-called Christian country. Quakers in those days were the chief target for insult and persecution; all the religious bodies sought their extermination. It was no doubt this terrible sentence which compelled John Crook – no longer a judge – to leave Beckering Park and find shelter at Hertford. He was a voluminous writer, his pamphlets being mostly written whilst in prison – one at Reading, one at Ipswich, two at Huntingdon and three at Aylesbury. He was in frequent correspondence with Isaac Pennington. Previous to his death he wrote a beautiful epistle to his children. 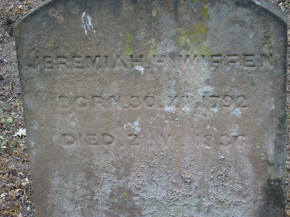 He died at Hertford at the age of 82, and his body was conveyed all the way to Sewell for burial. At North Crawley there is a Quaker farm at which a corner of a field was set for burials and it is still called today “The Graveyard field.” This farm was in the hands of the Marshalls for centuries. The first weddings to take place at Hogstye End were in1660:-William Cooke and Margerate Cook, Henry Bigge and Mary Smith, William Pixe and Elizabeth Allbright. 1661: John Whitehead, who was so badly treated at North Crawley, was imprisoned with Isaac Pennington and about 60 or 70 others, all from Buckinghamshire in Aylesbury gaol for not taking the oath. They had a large barn for a prison all to themselves. 1664: At Hogstye End, Thomas Harvey, Robert Page, Elizabeth Goodman, Adam King, Joseph Brinklow, Edward Austyn, George Cooper and John Butler all had their goods taken from them for not attending Church. Among the list of buried we find: Edward Austyn, Elizabeth Austyn, John Bigge. It is interesting to note the occupations of the early Friends. They were apothecaries, linen-drapers, grocers, shoe makers, milliners, woolcombers, cordwainers, pewterers, ale conners, maltsters, websters (weavers), theakers (thatchers), smiths, lacemakers, cbigrurgians (wigmakers and hairdressers), bruester (brewer), tanners, also the chirugeons (surgeons). Among the Woburn inhabitants was one Dorothy Sparkes, a gentlewoman surgeon of good report, who did much service, so they were advanced enough to have women doctors. A notable Quaker resident at Wooburn, in South Bucks was Jonathan Kingham, a fuller by trade, a cleaner, bleacher and dresser of cloth. An interesting section of the law enacted ‘Every fuller of his craft and occupation of fulling, rowing or tayseling of cloth, shall use taysels and no cards deceitfully imparing the said cloth.’ Jonathan Kingham also issued his coins and was official measurer of cloth for the area. Rowing was placing the cloth in rows or folds, or rollings. Tayseling was brushing to produce a nap or smooth surface to the same. Teazles are still used in the finishing of all best cloths. We find in the early rate book “For Jonathan Kingham’s fulling mill,” he died in 1675 and was buried at Jordans. William Allbright, the wife of Francis Coleman, Sarah Baker, Thomas Sinfield, Mary Saunders, Robert Gurney, all of Hogstye End Meeting, were fined five shillings each for attending a Meeting at William Allbright’s house, while William Allbright himself was fined £20 as also was the speaker. On another occasion the speakers fine of £20 was divided, £5 from William Allbright, £5 from George Gosley and £10 from William Cooke. As Friends would not pay, seizure of their goods followed. George Gosley had a haycock taken, Cooke a cart, household stuff and other goods; Gurney a kettle worth five shillings, and Mary Saunders six pewter plates worth twelve shillings, some belonging to her mother. On another occasion Mercy Cartwright and Thomas Harvey were deemed preachers and each fined £10. Robert Gurney and Thomas Ireland were both fined ten shillings and goods were taken worth twenty shillings and thirty shillings. Thomas Gamble, for allowing a meeting to be held in his house, was fined £20 and had seized five fat cows. (Thomas died 1711.) Richard Hunt and James Brierly were fined for preaching, and goods were seized to the value of £12/14/- and £11/8/-. Quakers continued to increase in numbers and in the power of self-sacrifice. Where there is a will there is an endeavor to find a way, and in the year 1673 Friends made up their minds to obtain a Meeting Place of their own. The owner of “Hogstye House,” where they had been meeting for so long a time, offered to sell it to them, with the burial ground attached. At first they took to the idea, and consequently issued an invitation for funds for the purchase of “Hogstye House” and its burial ground. The appeal produced £135/4/6 from thirty-two subscribers residing in Woburn, Bletchley, Bow Brickhill, Little Brickhill, Aspley Guise, Wavendon and Crawley. Doubtless there were many more members who would cheerfully have subscribed had their means been sufficient to permit them to do so – the spirit willing but the pocket weak. It seems very clear that the idea to purchase “Hogstye House” came in for very careful consideration and probably the Friends could not reach that unity of desire which was needed for so important a step, therefore, although the money had been subscribed, the Friends turned it down as their needs were only for a suitable Meeting Room and accommodation for the caretaker. For fully a year, they awaited definite guidance which duly came as the next record evidences. On a deed dated December 5th 1674, Francis King, yeoman, of Aspley Guise, sold for £50 three roods of land to William and Edward Cooke, both of Bow Brickhill; Thomas Harvey, yeoman, of Wandon; Henry Bigge, shoemaker, of Wandon; Francis Coleman, ironmonger, Woburn; Francis Ireland, gardener, Woburn; George Gosley, shoemaker, Bow Brickhill, and William Mathews, yeoman, of Aspley Guise. Most of these names are familiar from other records. There were six Cookes and their families. William being High Constable, held a high and important Office in the “Hundred”. He had the oversight and responsibility of all the petty constables, or watchmen, supervised all warrants, legal charges, accounts, entries of all employments, and saw that all wells, bridges and hedges were kept in good order, etc. There were a few small fees paid in, but the office was a loss as there was no salary attached to it. Thomas Harvey was the owner of Hogstye House in whose ground were buried many Quakers. The parcel of land as above mentioned, appears to lie next to that of Hogstye House. It was situated in a dell in a dense wood about a hundred yards from the main highway, very convenient of access, yet in quiet isolation, except for the labourers’ cottages attached thereto. There is sufficient evidence to justify the assumption that the present Hardwick House was once ‘The Grange,’ part of the Manor including Abbot’s Wood, Fuller’s Earth Pits. We are also justified in that Hog­stye House was renamed “The Grange” by Thomas Harvey, the owner, because the Friends Meeting was already well known as “Hogstye House Meeting” and continued so to be known for more than a century. This could not have been permitted except by the owner. Actual records do not give any account of the building of the new Meeting House or of the memorable occasion of its opening meeting. The reader would do well to sit in the quiet and allow his imagination free flight and no doubt the foregoing account will enable him to visualize what took place. We can assert with fair confidence that the new building was erected in the year 1675, thus predating Chesham (1682) and Jordans (1688). Jordans was constructed internally on much the same plan, having the triple room when so desired. The following entries in Parish Regis­ters illustrate the feeling towards Quakers: A sonne of George Gosley whom he named George, was put in a hole on March 24th. 1657: A daughter of Edward Austin was born and without being baptised. was named, as they say, Mary by its father. Still in 1675 it is recorded that: Francis and Ann Newman were helpful workers at North Crawley. Thomas and Elizabeth Marshall were pioneers at North Crawley, and added five notable birthright members, viz: John in 1665, Doyle in 1666, Richard in 1668, Sara 1670 and William in 1672. “The loss by fire sustained by George Flane and Henry Glidwell – two faithful Friends at North Crawley – the lower side of Bucks, being certified by divers Friends of that side of the Quarterly Meeting and from thence referred to this. It is agreed to be recommended to the several Meetings belonging to this and a collection therein respectively made, to be brought hither at the next Meeting, etc.” Ten Meetings responded to the appeal and the sum of £19/16/11 was contributed. In 1680, Hogstye House Meeting sent two subscriptions, amounting to £3/4/-, to Upperside for the redemption of Quaker captives in Algiers. There was, at this time, a petition to Charles II in which it was stated that 1,460 Quakers were still in prison; 30 of these were in Bedfordshire, 19 in Buckinghamshire. Hogstye End Meeting included both counties. This was dated 3rd of the 1st month called March, 1685/6. Masson wrote: “Up and down the country every gaol was filled with the fanatics called Quakers, cargoes of them were exported to the black ends of the earth; seldom were there less than 1000 in gaol.” Records state that between 1661 – 1697, 13,562 Quakers were imprisoned, 195 transported, whilst 338died from the effects of their suffering. The closing of Hogstye End Meeting was but temporary. On April 24th, 1681, George Gosley reported at Quarterly Meeting that they had resumed meeting together. This coincided with the general grant of more liberty to Non­conformists and was no doubt largely the result of William Penn’s influence at Court, but many are persuaded that it was a diplomatic political move; 1,500 Quakers were liberated and 2,418 Protestant places of worship re-opened. 1679 Martha Smith, a widdow buryed by the Quakers. 1680 John Thornton burned in H. Cunningham’s orchard at Newport Pagnell. 1684 Henry Glidwell, clothier, married Mary Ball at North Crawley. 1684 Thomas Dell buryed at Hogstye End. 1686 Thomas Burgis, Newport Pagnell prosecuted for not attending Church. 1689 Edward Cooke, Bow Brickhill, had goods valued at £18/15/- seized for tithes at Aspley. The Quaker Meeting House at Hogstye End, Wavendon. A house at Waterlane, Sherrington. A part of Sara Lambourne’s house at Aylesbury. The house of James Brierly, Olney. Part of John How’s house a Chesham. Part of Joseph Windis’ house at Amersham. A Meeting House called New Jordans at Chalfont St. Giles. 1701 The first Quarterly Meeting was held at Hogstye End. 1706 Thomas Harvey, yeoman, died, buried in his garden (yet he gave £13 towards the new Meeting House and burial ground). 1709 William, son of Bernard and Mary Stimson, not baptized his father being a Quaker. 1710 Richard Underwood buryed at Hogstye End dying at Aylesbury in prison. According to one record between the years 1658-1750, one hundred and fifty Quakers were buried at Hogstye End. A very notable family now comes before our notice, whose origin may – so far as Quakerism is concerned – be said to arise with Mercy Cartwright and her husband Isaac. He was born in the year 1618, a Churchman with broad religious views, somewhat of the same calibre as his notable Cambridge namesake who was expelled from Cambridge for leading a revolt. Isaac was a distant relative of Thomas Cartwright who completed the building of the Royal Exchange. Isaac died 1666 when only 48 years of age, leaving his wife, Mercy, to face life alone. On her husband’s decease she appears to have thrown in her lot entirely with the Quakers, for within two years she was side by side with them before the Court for refusing to go to Church, and it is to be noted that the name of Richard King was in the list. When the subscription list for building the New Meeting House came along it was to be noticed that these two names again came together; companionship in ideas tend towards a unity of spirit. Richard King and Mary Cartwright were married. There was a daughter by the first marriage who was named Ann, born in 1665 and was therefore 10 years of age when the New Meeting House was erected. Years passed quickly by and a young rich London merchant, Thomas How, fell in love with this attractive and wealthy young woman, and this union was the commencement of a most wonderful pedigree of Quakers, almost as notable as the Wheelers. On the death of Mercy King (née Cartwright) in 1704, Thomas How, the son-in-law, took possession of the fine mansion at Hogstye End now called “The Old House.” It is mainly Tudor and was built about 1574, being now in the possession of Dr. G. Herbert Fowler, who has spent large sums to restore it to its original splen­dour. Its extent may be judged by the fact that it was taxed in the early days for its eight hearths (a considerable number in those days). The issue of this marriage was three children: Thomas, who remained a bachelor; Richard, who married Susanna Briggins, and Mercy, who married Herman Kingsberg, a friend of her father who had trading relations on the Continent. Thomas How and his wife spent much of their time in London as his business was centred there, and in the year 1722 Ann, his wire, died. The account reads as follows: “Ann How, wife of Thomas How a city merchant, who died of smallpox was buryed in wolen. She dyed in London and buryed at Hogstye End in 1722 in the parish of Wavendon, in a leaden coffin.” The certificate was signed by Herman Kingsberg, her son-in-law. Thomas and his brother Richard (who was a linen draper) and Richard’s eldest son named Richard, were equal owners of the Old House mentioned previously. It has been written, “Unto him that hath shall be given,” and so it seems, for later in 1761, when “The Enclosures Act” came into operation in this area, Richard How the elder and Richard How the younger and Briggin How came in for the largest share of the land. As it so happened, it came into worthy hands, all three being excellent Quakers and honourable citizens. Another notable Quaker was Richard Hartwell (son of one of the first members), who died on 16th of the 6th month, 1739. His remains and those of his wife were buried in his own orchard and the grave is now surrounded by an iron railing about five feet high. By his Will, dated. December, 1734, he left his property known as Hartwell Farm, with 45 acres of land rented at £60 per annum, together with other buildings, for the benefit of six poor unmarried people, three of whom were to be Quakers and the other three inhabitants of Cranfield. There was also granted 3/- per week, a supply of coal and ten shillings per annum for Christmas gowns. In the year 1898, with the consent of the Charity Commissioners, the farm was sold and the money invested in Government Stock. The will is administered by six trustees, four appointed by Luton and Leighton Meeting, and two by the Cranfield Council. The Trustees were empowered to acquire any other house or houses as they should see fit, consequently one of the beneficiaries is living in Finland. In the year 1932 it was found that the cottages required re-thatching, but as the Trustees had been too generous with the funds, the Quaker Trustees re-thatched them at their own expense. Until about 1840 Cranfield had a Meeting House and burial ground situate in the place now called Gossards Green. The Meeting House was used as a cot­tage for some years, then about 1866 was demolished and the whole site is now let for a hen run at 10/- per annum. At the rear, where once stood the Meet­ing House, a burial ground contains the remains of about seventeen adult Quakers and several children, the last burial being about 1860. Alas! there is no “Notice” to indicate this fact. Amongst those interred there are John and William Day, Sara Squires, Susanna Tomlin, Ann Hands, Thomas and Sara Cubbage, Eliza Harvey, Ann Hake and several of the notable Grimes family. Here also at Cranfield a few years ago (1888) James Goodman built two sets of cottages and the Society of Friends another, for aged and infirm widows. The year 1742 saw a goodly list at Hogstye End of monthly subscribers which included Richard How, Mercy Kingsberg, M. Barber, W. Church, J. Smith, T. Turpin, Widow Cook, T. Cook, D. Troup and A. and T. Walduck. It was the custom for Friends to sub­scribe monthly instead of yearly as now, and this list is evidence that Hogstye End was not asleep in those days. The date 1761 was important in the life of Hogstye End as the year of the birth of one of the most beautiful souls incarnated in the Quaker movement, in the person of Elizabeth Pattison, born at Wellingborough. According to her son, B. 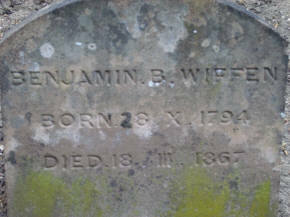 B. Wiffen, her father, a Quaker, was a blacksmith, a worker in black metal. Being of a fickle and unsettled temperament he was not successful, and the child, when only five years of age, was taken away from him and went to live with her uncle, William Joyce, at Aspley Guise. He was a retired hosier, of London, separated most honourably from his wife. He resided at the “Red House,” attached to the Tudor mansion owned by the Hows. The child’s mother died within two years and the child was left in the sole charge of her uncle Joyce. Under him she had a very strict upbringing, but withal a very valuable training in the art of living. Habits of early rising, hard work and charity were the order of her life, and although her uncle’s income was very limited, he made a rule of distributing to the poor every Monday morning. The story of her childhood is a fascinating one. When thirteen years of age she was sent to work at Chelmsford, where she found life cruel and very hard, so hard in fact, that it played upon her mind to the extent that one night when her com­panion had fallen asleep Elizabeth arose and went out with the intention of committing suicide in the river. She paused on the way to sit on a stile and the still calm of the night, combined with the soft air and the sleeping cattle, all subconsciously worked upon her soul and a quiet calm and strength stole over her, so that she felt a strange new power awaken. She crept back to her room with her secret known only to herself. Very soon afterwards she removed to another employer, a tea dealer named Day, and served as a shop maid. It was here that she taught herself to write. When she had reached the age of eighteen years her uncle Joyce died and left her the sum of £50. This she did not inherit until she became of age, and in the meantime her employment by Mr. Day gave her valuable business training which proved its worth later in her life. Upon coming of age she paid her legacy of £50 as an apprenticeship fee to a mantua maker, the wife of a gardener at Woburn Park. Being now freed from servitude she spent the three most delightful years of her life. Still rising at 3 or 4 a.m. she was often reading or sewing in a boat on the lake before breakfast, and here we shall leave her for a time. Hogstye End in the meantime was fulfilling its various activities with its usual vigour. Friends were still coming in from the distant villages and townships. From Leighton Buzzard there were several who were simply attenders. It was in 1771 that Peter Bassett, then a young man of twenty-four, gave a subscription to the funds. He was the son of Ann Bassett wife of William Bassett, who carried on a business as both linen draper and corn factor, and who died 1783. In 1773 Joseph Gilks, who came from Clackmore 1759, gave in his report of a visit to Leighton where he interviewed several applicants for membership. These included Ann Bassett, born 1726, Peter Bassett, born 1746, John Grant, born 1751, Martha Heley and Susan Heley. Within six months, i.e. 7/7/1773, a Monthly Meeting was held at John Grant’s house at Leighton, and Hogstye End and Leighton became a United Meeting; in fact, most of the Preparative Meetings were held at Leighton for many years. Peter Bassett married Ann Dollin, most probably a descendant of John Dollin, a notable Quaker in the county, who in 1683 was imprisoned for three months for being absent from Church, consequently for some years we had two Ann Bassetts in service. Peter’s business ability and character became so renowned that farmers and others left their money in his care and thus was laid the foundation of Bassett’s Bank. “Having conformed for several years past to the too general custom in the town of opening shops in the morning on the first day of the week called Sunday, we have sorrowfully experienced the disagreeable consequences arising therefrom. Therefore, in order to be more at liberty ourselves and to give more liberty to our families and customers to perform their necessary but too much neglected Christian duties, and for no other motive, we are induced to decline keeping open our shops on the said first day of the week, from and after the twelfth of the third month next. In Leighton Buzzard, Benjamin Reeves, although a grocer, was also a brewer, and his son, Samuel, carried on the business, acting at the same time as Town Surveyor. This caused him on one occasion to complain to Lord Tavistock about neglect in the drainage of a certain area. In trading, bargaining was the national custom, but the Quakers introduced fixed prices, and so potent was their influence that other traders who adopted fixed prices used to say, “I’m a Quaker in that,” Most of the old established breweries of England and Scotland were founded by the Quakers. An odd story may be recorded because five notable local Quakers are introduced. The writer has examined the original document. “A piece of oak about two feet in diameter, 20ft. long and about 5ft. from the end to the centre, on sawing was found a live toad very large in a hole big enough to contain it, which on being thrown out died almost immediately. From the end to the toad up the pith was a crack, the crack continued several feet above the toad which was probably nourished by the sap. The oak came from Fenistratford I, the underwritten, sold the timber to George Gurney and found the toad and showed it to Messrs. How Kingsburg and Joyce. Witness my hand March 25th, 1787. I, the underwritten was present and saw the toad. I saw the toad. The incident may have occurred long before the document was signed or the Quakers mentioned may be the children of those in these records. About the year 1770 or the Spring of 1771, the Captain of a naval press gang and his wife paid a visit to Woburn on his way to the North. He was a member of an old English family and a descendent of an MP who had sat on the trial of Charles I. On one of his rambles through the woods, he came upon the little thatched Meeting House at Hogstye End and, curiosity being aroused, he and his wife entered the building and sat down among the worshippers. The entrance of a naval officer arrayed in full uniform with sword and hanger, caused a disturbance of the equilibrium and moved Mary Brook to vocal ministry. So powerful and pointed were her remarks that Thomas Bradshaw and his wife – for such was their name – made many inquiries and decided to prolong their stay and learn more about the Quaker faith. After a short time they were convinced and the naval officer found himself no longer able to follow his profession of rapine and murder. He thereupon resigned his Com­mission and gave up prize money that was due to him and, with his wife, to the great displeasure of their family and connections joined the Society of Friends. For some time he was unde­cided as to his future income, having no trade or occupation to which be could turn. The circumstances were made known to Richard How, of “The Old House,” and be allowed him a few acres of land and a cottage. In those days cottages with five acres of land could be obtained for £11 per annum. This, with small capital in his possession, gave him a start at farming, but, being a seafaring man, he knew nothing about the land; ploughing land was very different from ploughing the ocean, and fighting men was not like fighting drought, or blight, or the floods, and in a few short years difficulties began to arise. Creditors pressed and the inevitable had to be faced. There was not sufficient money to pay his creditors, yet principle demanded that they must he paid. His landlord reminded him of his wages and the prize money which was due to him from the Government, but he still refused to accept it. Yet his debts must be paid. Thomas Bradshaw was no philosopher, no commercial schemer, but he had sacrificed all for a new principle and could not accept blood money. His friend, Richard How, explained the pro­blem and solved it for him. He obtained all the essential papers, had them all duly signed and the whole of the money was obtained from the Government and the creditors were paid in full. Thomas Bradshaw retired to his cot­tage and for some time the Friends helped him most generously, for all his relations had cut him off entirely. To all appearances he made several efforts to get clerical work, the only work he was qualified to do, but not until the year 1791 did be get an appointment as reading master, and his wife as Matron at Ackworth. While Thomas Bradshaw was going through this time of dire extremity, Elizabeth Pattison, of former mention, comes once again into the drama. We left her reading and sewing in a boat on the lake – “The Lady of the Lake” – and it is here we again pick up the thread of her life story. She had hired a room in a cottage and started business for herself and immediately success followed, for she was so thorough that she could not fail to give satisfaction. Very, soon she found it necessary to move into a house with a shop attached (since demolished and replaced by the War Memorial), which was situated next to the George Inn in Woburn, today known as “The Bedford Arms.” It was here that a smart well-read, commercial traveller from Birmingham was attracted by her shop, and possibly heard what pleased him, in the Inn. He was a Quaker and here was a single young lady a Quaker also. It does not require a large imagination to anticipate events. In September, 1789, John Wiffen, a traveller in cutlery and ironmongery, informed the Friends at Hogstye End that he and Elizabeth Pattison intended to marry. Customary investigations proved satisfactory, and sanction was granted in December, 1789 (his transfer had been received the month before). The mantua business was quickly removed indoors and the windows and shop were transformed into an ironmongery and cutlery business. Its position was excellent, being next door to a coaching inn where large numbers of coaches passed daily. The constant excitement of changing horses, luggage and passengers, and the coming and going, with the welcomes and farewells, provided a fine study in humanity. Cowper, the poet, stayed at the Inn to lunch on one occasion and the landlord, so impressed with the honour of entertaining so noteworthy a person, refused any payment, saying the honour was ample compensation. Woburn Village was well known even in those days, for the entrance gates to the famous Woburn Abbey were close at hand and were the scene of many notable events. Robert Gurney, who has already been mentioned, was a Quaker and lived here; and it is not without interest to note that Thomas Gurney (born 1705), the pioneer in shorthand, who was the eldest son of John Gurney, miller and lessee of Crawler Mills in Husborne Crawley, was also the grandson of a reputed Quaker, another Thomas, a contemporary and probably a kinsman of Robert. In 1737 the younger Thomas obtained the post of Shorthand writer at the Old Bailey, and at a later date (1791) his son, Joseph Gurney, obtained the more important post, then an exclusive one, of Shorthand-writer to the Houses of Parliament. Thomas Gurney, the shorthand writer, possessed a pocket knife with the initials “T.G” and the inscription “Given to me by George Fox at Lichfield.” The “me” was the shorthand writer’s grandfather, Thomas Gurney, a Quaker who at one time travelled with George Fox, and who was father of John Gurney, the miller of Crawley Mills. John Wiffen, the commercial traveller, proved a good husband but a poor business man. He passed away at the early age of 40 years, leaving an insolvent business and a widow with five children. Elizabeth, his widow, as has been already stated, was a woman of remarkable qualities and a story is related of how, in the early part of her married life, probably first or second year, she had a great concern towards Thomas parents, who were drapers, decided to apprentice him to a draper at Bishop Stortford, but reels of cotton and knots of tape had very little attraction for him. This weighed heavily upon his soul, so much so, that his whole being revolted against his work and he returned home. Benjamin B. Wiffen, the biographer who sketched his life so admirably in the poem entitled, “The Quaker Squire”, wrote thus about him. “Thus gently was he committed to the tide of life to try his own powers, to spread his own sails, to ply his timid oar, his venture was not long, for after a few months trial he returned to the sheltered haven of his birth and after making a few more efforts it may be figuratively said, he unrigged his little barque and laid it to rest” He was no idler, however, for no name appears so frequently in our records. He was registrar of births, deaths and marriages for a great many years. We return to Elizabeth Wiffen, the widow who was left with five children. The eldest of these was Jeremiah Holmes, born December 30th 1792. He was educated at Woburn, Ampthill and Hitchin, and from there passed to Ackworth, where at the age of ten he showed marked ability and taste for poetry. His love of handicraft. especially wood carving, was keen. On leaving school he apprenticed himself to a schoolmaster at Epping where he remained until 1811 and at the age of 19 years he returned to Woburn and opened a school for Quaker children. His poetic nature led him, with two other friends, to issue a volume of poems. In 1821 his genius was sufficiently recognised to earn for him the position of Librarian to John, the Sixth Duke of Bedford. In 1828 he married Mary Whitehead at the Friends Meeting House at Leeds and after that took up his residence in the small hamlet known as Froxfield, lying at the eastern entrance to Woburn Park. Here he lived until his death in 1836 at the age of 44 years. He was a renowned scholar, a fine linguist: speaking Latin, Greek, Hebrew, French and Spanish, while his wife also was a linguist and an artist. In quiet and forgotten ground, the historian, friend and poet lies. To all lovers of poetry, Jeremiah Holmes Wiffens poems have a peculiar charm of their own. The poem written on the arrival of his first child takes rank with Tennyson’s on a similar occasion, and by many readers would even be preferred. On a brass tablet fixed to an oak tree just inside Woburn Park, where Robert Hobbes 1529 the last Abbot, was hanged, is a verse written by him, commemorating the foul deed. His next brother, Benjamin Barron Wiffen, born 1794, was also educated at Ackworth, and the brother were together for some time. To complete the family, we must mention the three sisters, Mary born 1791, Sophia born 1797 and Priscilla born 1799. It was while Benjamin was at school that his father died, and upon his leaving school he joined his mother in the business and for several years worked hard to make a success of it. His spare time, however, was spent with his books and his verse. He learned several languages and, like his brother, took a keen interest in Spanish. By the year 1838 the business had so far succeeded that he and his mother and two sisters, Mary and Sophia, retired and went to live at Mount Pleasant (now part of Aspley Guise), then a charming secluded village on the brow of a hill overlooking the Park and lands, only about half a mile from the residence of Richard Thomas How. He passed away in 1867 at the age 73. Priscilla, the third sister, had in 1821 married Aleric Watts, the poet, and in so doing was expelled from the Society of Friends because he was not a Quaker. We now return to Leighton Buzzard at about the time when the Sunday closing of shops had been established; an interesting move was made in the affairs of this section of the Friends. John Grant, no doubt to the delight of all the Members, purchased, in the year 1786 from Edward Dawson, certain property in North Street, now represented by the present cottages on its frontage, the Meeting House and the space between. At that time one or two cottages stood where the present Meeting House stands. We have not the actual date of its building, but most probably it would be about that time. The southern portion was first erected as it stands today, but owing to overcrowding the northern part was added later. In 1807 John Grant further bought three acres of ground adjoining from Leah Firth, a widow. A plot containing 854 square yards next to the Meeting House was set apart for a burial ground and the first burial therein was our Thomas Bradshaw of naval and scholastic fame. Next, a child of six was interred and the third was the burial of a suicide 22 years of age. A very singular fact is recorded in 1905; that the property was purchased from a Dawson, the first grave was dug by a Dawson, and no grave had ever been dug there by anyone but a Dawson. Leighton Buzzard Meeting has had many notable members. Amongst them at one time were Tindall Harris, Edward and John Harris, and William Manly, who accompanied the delegation to Queen Victoria on the accession in 1837. An incident on this occasion which would not be without humour to us, is related – as to how the question of the Quakers, not removing their hats to anyone in authority, was dealt with. As the deputation passed up the staircase, lined on each side with Crown officials, their hats were dexterously removed by these officials, neither party showing any signs of resentment. Other members of this meeting were Josiah Wheeler, Theodore Harris, Peter Bassett, John Dollin Bassett, Francis Bassett, and many others too numerous to mention. In earlier days Isaac and Jane Sharples had visited Hogstye End and when the 19th century opened, Joshua and Joseph Sharples were living at Leighton Buzzard. Joshua was secretary of the first Lancastrian School which was opened in the year 1813, and it was almost entirely financed by the Quakers. This was no doubt the forerunner of the present adult schools. In 1818 both of them left Leighton Buzzard. John Grant, previously mentioned had several businesses in hand, so he merged his banking business with that of Bassetts. He died at the ripe age of 91 years in the year 1842. His widow handed over the Meeting House, with the cottages and the burial ground to the Society and appointed as Trustees Samuel Reeves, brewer, Charles Ridgway, draper: Charles Poulter, grocer; Francis Bassett, banker; Henry Ridgway, draper, and William Manly (the younger), grocer. Mrs. Grant was given a seat on the Board of Directors of the bank, which she held until her death in 1853. The actual founding of Bassett’s Bank in 1812 was by five gentlemen of high standing in the district, all of whom were Quakers, their names being Peter Bassett, John Grant, William Exton, Joseph Sharples and John Dollin Bassett. It was first called Bassett, Grant & Co., then Bassett, Son and Harris, and afterwards Bassett, Sharples & Co. Theodore Harris was also in partnership, his father being a corn factor in Stoke Newington. His sister married a Bassett. John Tindall Harris, a brother, wrote several books on “The Writings of the Apostle John.” At the time of the foundation of the bank, J. Dollin Bassett was only 21 years of age, Joseph Sharples 22 and William Exton 27 years. These three in 1820 opened a bank at Hitchin under the name of Sharples, Bassett & Co. It is interesting, also, to record that John Dollin Bassett, with one or two other Friends, saw the future for gas in the life of the community, and floated a company, thereby benefiting the Public, but at the same striking a grievous blow at the tallow chandlers and oil merchants. For four generations, the Bassetts were chairmen of the Leighton Buzzard Gas Company. Whilst writing of these pioneers we are compelled to think that it is far better to possess a determined purpose in the soul than be born “with a silver spoon in the mouth.” Life consists of what we are, and not what we possess. Friends were friends to all who worked for the common weal. Samuel Reeves, Benjamin Barron Wiffen, John Dollin Bassett, Charles Ridgway, William Marshall, Robert Walmsley, William Exton, William Cutforth, Joseph Barnes, Jeremiah Wiffen, Joseph Camps and Edward Latchmore. Under the date 2/9/1822 there is entered “paid £13/14/2 for legal costs of the same.” There was another list discovered, but the above can be verified; the members named were all active at that date. It may be interesting to record that the original building of 1675 at Hogstye End was an Oak frame and plastered, with a thatched roof. A cottage occupied one third of the building and the Meeting House two thirds, this latter being divided into two sections by a partition with sliding shutters, one section for the men and the other for the women. There were stables on the North side for several horses, and a shed on the South side for the accommodation of traps and chaises also a “horsing block” (sometimes called an “Upping stool”) was erected there for the convenience of easy mounting. Cruel vindictive persecutions were at this time being endured by our Members. Samuel Theobald who married Ann eldest daughter of Peter Bassett, and lived in London was, on November 25th. 1836, brought before Judge Phillimore on the charge of refusing to serve as Churchwarden at Allhallows’ London Wall. (Imagine asking a Quaker to be a Churchwarden!) After a very lengthy and costly trial, the case was dismissed and Theobald was granted exemption. The legal costs, however, were so great that he was ruined thereby. A special account was printed and published by Yearly Meeting. John Grant, Peter Bassett, Benjamin Reeves, Abraham Mallison and John Wiffen were all fined for not joining the cavalry. Even William Corder – son of Ruth and John Corder – apprenticed with Peter Bassett, was fined, but as he had no property, other than that he stood up in, he was let off. Richard Camp had goods seized to the amount or £17/10/-. J. D. Bassett, Edward Latchmore and Samuel Reeves were treated in the same way, William Marshall had goods taken valued at £52/16/-, William Exton £30 and such are a few of the records. Our local register between 1795 -1848 shows a total of £2,965/11/5, such was the penalty for obedience to conscience. For several years the Hogstye End Meeting had not held its own. A steady decline set in about 1840, several of the old folk passing over as the following shows:- Elizabeth Wiffen. at 80 years in 1842, a wonderful soul; Sarah Sears, 79 years in 1846; Mary Wiffen, aged 58 years in 1849, Jane Herbert, 74 years in 1854; Sophia Wiffen, 67 years in 1864, William Fitzwilliam How 78 years in 1864, and John Marshall, 63 years in 1864, and so the story is told. It would be difficult to survive such an exodus. The last Monthly Meeting was held on May 12th, 1865. Two years later the saintly and beloved soul of Benjamin Baron Wiffen passed onward to a new and fuller life at the age of 73 years. With so many Friends having passed away the Monthly Meeting felt a deep concern respecting the life of the society at Hogstye End. There were still a few staunch members, but age and infirmity prevented them attending the Meeting. In 1865 Monthly Meeting sent out an S.O.S. to Friends at Ampthill, Newport Pagnell and Leighton Buzzard to come as often as possible and sit with the Friends at Hogstye End. This was responded to by Friends from all three places, but the local Friends were unable to respond, and no newcomers were forthcoming. A very interesting event recorded under the ancient roof in 1866 was the marriage of Alfred Lucas with Jane Drewitt. He was the grandson of Joseph Lucas. From this marriage the world rejoiced the life and work of E. V. Lucas, essayist and writer, and chairman of Methuen & Sons, publishers, who died in June, 1938. A sister of the bride married Norman Shepherd whose two daughters became Mrs. George Henry Latchmore and Mrs. Theodore Ransom. The last Preparative Meeting was held in 1869. The Meeting, however, survived, owing directly to the constant and undying devotion of Richard Edward White, then residing at Ampthill. Every first day morning this devout man walked eight miles each way, bringing with him his lunch, so that he might sit in worship with the few remaining worshippers. So faithfully did he keep his trust that villagers on the route set their clocks by his passing. The company, however, dropped from four to three, then only one remaining Friend met to join him in worship, he being one Harbert, a lace maker, who had suffered much for his faith and loyalty, and then he failed to arrive. It happened. therefore, that on November 5th, 1871, after four years of consecrated devotion and on his seventy-second birthday, Richard Edward White felt that the concern no longer possessed his soul, and the Meeting House was consequently closed 11.5.1871. Such a faithful discharge to the call of God should be an inspiration to all who hear it. “Let fruit of action go.” obey the call. His devoted wife passed onward in 1873 and he died at the age of 80 years in 1879. His memory will be revered so long as Hogstye End Meeting exists. He had two daughters, Maria and Mary Frances, who came to live in Aspley Guise after his decease. About the year 1876 Major Wyndham, brother-in- law to Theodore Harris, became interested. He stood 6ft. 3ins. in height and was a survivor of the celebrated “Charge of the Light Brigade”. He was living retired at Woburn and had taken up missionary work to occupy his time. He frequently held services in the various villages of this area, and although not a Quaker, obtained the keys and made an attempt to restart the work at the Meeting House, but without permanent success. The next attempt to continue the work is entered in the Monthly Meeting records under the date 11/9/1883, when the Meeting acceded to the request of Henry Tylor “that the Woburn Sands Meeting House should be re-opened for worship on First Days.” It was forty years before this that Henry Tylor had married Eliza Bassett, daughter of John Dollin Bassett, and had then mem­bership with the Peel Monthly Meeting. They had nine children, five sons and four daughters. Their son Charles born in 1845, died in 1930 at the age of 91 years. He was the father of the pre­sent E. Merrick Tylor. The eldest daughter, Anna Mary Tylor. was born 1847, died a spinster at the age of 83 years in 1930, and was buried at Woburn Sands. Her mother, Eliza Tylor, born 1794, died 1885, was 91 years of age at her decease. The memory of the Tylors in Woburn Sands is still blessed and beloved by a num­ber of residents. On Henry Tylor leaving the area in 1886, the work once more lapsed, but it was not the end. Though silence reigned, the place itself spoke its message. Besides the efforts or Major Wyndham and Henry Tylor, the Meet­ing House had been used on the occasion of the following burials. Mary White 1876, Richard Edward White, 1879; Maria Corder, 1881 Eliza Tylor, 1885, Lucy How 1889, Richard Hayllar 1890, William Chantler 1892, and Maria Thorpe in 1895. During this period Luton and Leighton Monthly Meeting was held at Woburn Sands in 1890 in the third month, and there were about forty members present. The next move in the events came in 1896, probably through the influence of Friends at Newport Pagnell, especially W. R. Chantler. William Charles Collyer, a native of Ridgmont. but living at Northampton, had a concern to revive the work. With the consent and the support of the Home Mission Committee, he got into touch with Austin Bayes, a local chemist, and several others, and they held their first Meeting on May 3rd, 1896. Abel Bunn and John Collings, of Leighton Buzzard, together with several others, soon joined them. W. C. Collyer came over from Northampton every weekend and stayed with G. H. Bizzel, a local butcher and fishmonger, who, with his wife, were the first to join the Society. W. J. Horton had joined Austin Bayes in business and these all soon became enthusiastic as the Quaker approach to religion was a marked change from the orthodox Church and Chapel methods of worship. The old Meeting House with its odour of sanctity, its cloud of witnesses, and its deep and ancient associations, seemed to grip their minds. Morning Meetings were for worship, and Austin Bayes started an early morning Adult School. The inaugural meeting was held in the village Institute under the chairmanship of the local schoolmaster, Mr. Steadman and William White, of Birmingham, was the speaker. It was a great occasion. A large school was soon gathered together and with increasing activities the need for repair and improvements arose. The dilapidated and forsaken place had to be modernized. Monthly Meetings granted £12/3/-, then £14/8/6, and then £22/16/-. The Meetings were so enjoyed that many were the occasions when they were held outside, and on one occasion people stood on the sloping bank on the opposite side of the road. In 1897 W. C. Collyer found the work growing far beyond the time at his disposal and therefore wrote Monthly Meeting to that effect. After the essential preliminaries W. G. Hall, a missioner, was sent here for a month to see if his services would supply the need. This proved an excellent move, as he had had previous experience of the work. Weeknight Meetings, Lantern Lectures and many kinds of attractions were introduced and large audiences were drawn together. 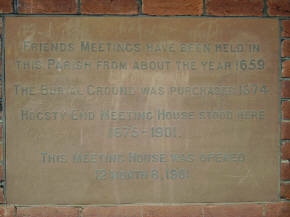 As the Old Meeting House could not cope with the demands, urgent applications were made to Monthly Meeting to supply a new Meeting House. This matter was fraught with such deep problems, that it was not until two committees had fallen, and a third had discussed the question for nearly two years, that the were able to recommend it and that only after asking the advice and help of Quarterly Meeting. Meanwhile local Friends were so strong in their enthusiasm that they had obtained money and promises amount­ing to nearly £800. The final sanction, however, was not given until the 7th month, 1900 when R. Chantler and Francis Littleboy were appointed advisors to the Committee. Plans were drawn up by Usher and Anthony of Bedford, which found general acceptance. Alas, however, we have to record that the plan which represented a Meeting House was altered to give it such an elevation that it produced a Public Hall somewhat out of harmony with Quaker ideals. Tenders for the work were accepted from W. T. Sharp, of Ampthill, for £1389. Of this, Monthly Meeting contributed £100 and another £50 the following year. The last Meeting to be held in the ancient, sanctified and beloved old Meeting House took place on May 19th, 1901. The demolition commenced the following morning, and thus passed out of sight the “Power House” of unnumbered children of God, men and women who in unity had felt the power of the Spirit and had crown strong thereby, for we are all one in the Universal, and in the Universal we become God-like. The Author desires to acknowledge his indebtedness to Marion Latchmore, Emma Collings, Hugh E. Seebohm, Wilfred Brown, Reginald L. Hine, Dr. Fowler. C.B.E., Frederick G. Gurney and F. G. Emmison (Clerk of the Records, Bedford), for their most valued assistance also the Clergy for the ready access to the various Church Registers, and the Library Staff at Friends’ House for the access to theirs.